This San Antonio / San Rafel villa comfortably sleeps 21 guests. Villa Maria is one of our longest established properties and is hugely popular year after year due to its spacious interior and grounds. It is laid out over various split level floors, with numerous terraces and social spaces. It is an ideal villa for groups and families looking for a large villa near San Antonio. Villa Maria is in the fantastic location of Can Tomas, only a few minutes’ drive in either direction to the beaches and nightlife of San Antonio or to the bars, restaurants and clubs of San Rafael. The ‘Sunset Strip’ of Café del Mar, Mambo and Savannah, plus the beach club glamour of Ocean Beach are easily reached from Villa Maria. 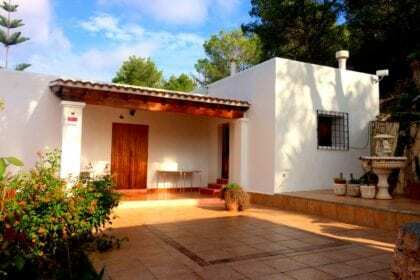 In the nearby San Rafael area, you are within a short drive of Privilege and Amnesia and ideally located only a couple of minutes’ drive from Ibiza Rocks House at Pikes. Villa Maria is a light and spacious villa with attractive grounds and numerous social spaces, in a peaceful location but ideally situated near main transport routes to the busiest parts of the island. Entrance to the property is through large iron gates at the top of a driveway that leads to a parking area for up to three cars. Villa Maria has really beautiful outside spaces, with a large area laid to lawn, various fruit trees, palm trees, tropical shrubs and exotic ‘Birds of Paradise’ plants. From the driveway there are steps up to the front door that takes you into a high-ceilinged hallway. To the right is a bathroom, a twin bedroom and a double bedroom with four-poster bed. Ahead is a split level bedroom with one single and one double bed. Down the stairs to your left is a large double bedroom and another bathroom plus a further bedroom with three single beds. From here you can access the back door to the outdoor kitchen, with sink, oven and hob, washing machine and large fridge for stocking plenty of cold drinks for the outdoor bar. There’s a large shaded dining terrace and the spacious, paved pool area with plenty of sun loungers, a chill-out area and a brick-built barbecue across from the patio. The large pool is the focal point of the exterior and is of ample size to happily accommodate all guests who may want to cool off at any one time! Upstairs to the first floor of Villa Maria, you’ll find a well-equipped, country-style kitchen with dishwasher, another fridge-freezer and an oven. Adjoining the kitchen is a large dining room and comfortable sitting room for those wanting to escape the heat at any point of the day. For those who prefer to enjoy the sun all day long, there is large terrace off the dining area overlooking the pool. A few steps up from the living area is another high-ceiling bedroom with a single bed and two bunks. On this same level is a modern bathroom with a Balinese tiled shower and a door leading out onto another roof terrace with a shaded chill-out bed and fantastic views towards the sea; the perfect position from which to enjoy the spectacular Ibizan sunsets of the west coast. There is a further double bedroom at the top of the house with its own private terrace and the same wonderful coastal views. The two new bedrooms are on the lower level accessed by a staircase from the ground floor. There are two twin bedrooms and a spacious shower room plus a small lounge area. Spacious, roomy, airy and amazing views. Excellent pool and multiple social areas. In general an excellent villa. We loved the poolside area and roof terraces. The villa was beautiful. Having fully-stocked fridges when we got there was amazing, and the villa itself was superb. I was incredibly impressed with the service Ibiza Villas 2000 offered – it was superb. The views and different level terraces were ace – the villa was perfect. Our party were delighted with Villa Maria and everybody throroughly enjoyed their stay. I would not hesitate to recommend Ibizavillas2000 to anyone. Thanks for your hospitality team at the house. Everything was great and we had a very good experience. Absolutely fantastic holiday in villa Maria, all the information provided was exactly what we needed for an amazing time. I will definitely be booking again in the future.